I have decided to do a series of posts on designs trends that I find incredibly beautiful but terribly impractical. My plan is to do one of these posts per week until I run out of my growing list of "designer trend don'ts." I didn't want to group them together because it just seems so negative to post a series on don'ts when we are all looking for do's! My first don't is open kitchen shelving. It can be beautiful and I'll give some examples to prove my point. Every time I see one of these kitchens I pause and give that classic, positive, "Ohhhh!" reaction. In fact, I collect these photos because I love the appearance. I, too have white dishes that create attractive, orderly stacks. These do speak to my OCD side and visible order is a beautiful thing. Mix it with some handmade pottery and wood tones and I am a happy camper. But the reality is, if I open all my cabinet doors and take stock, it is clear that about 20% of what is in there is visually attractive. 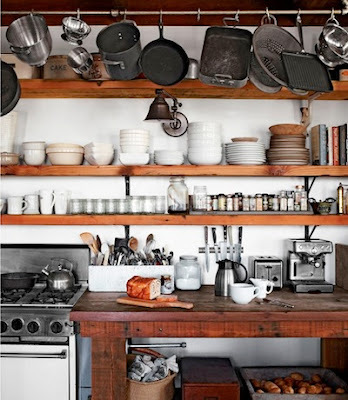 The rest, although absolutely necessary for daily cooking and living, just shouldn't be on display. So where do you put it? The bottom cabinets are full. A normal house just doesn't have the space for this trend to be practical. My question is, who thinks up these trends and how do they become popular? Things in home design shouldn't become trendy only because they look great. They have to function extremely well. 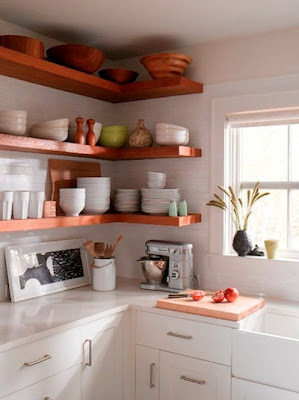 Granted we all live in our homes differently and if I didn't cook, I might consider open shelves. But then what about dust? Do you wash the dishes before you use them as well as after? I just don't see the advantage of creating new chores! I am embarrassed to admit how stunned I was to see the greasy crud that settled on the top of my old kitchen cabinets. I perched on a ladder with bucket and soap and tried to clean them occasionally, but I knew the job wasn't getting done. When we had our cabinets replaced (oh, about 15 years ago!) I had them built to go to the ceiling just because of that crud. It is much easier to regularly wipe the cabinet doors. A possible compromise is open shelving in the eating area like in the image below - reduced crud but dust still has to be an issue. I'd love to hear from you on this topic. 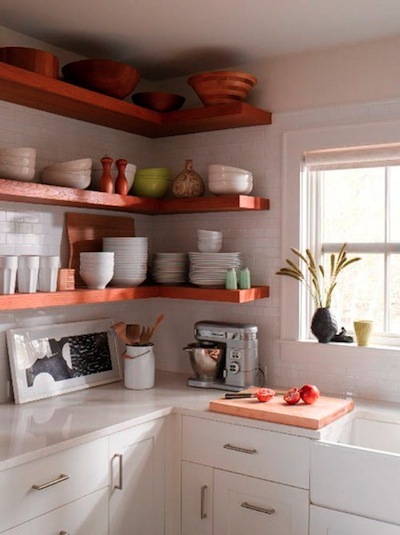 Open shelving - do you have it or not? Do you want it or not? If you've got it, is it just another chore? Why do you think this trend caught on? I have to agree with you! 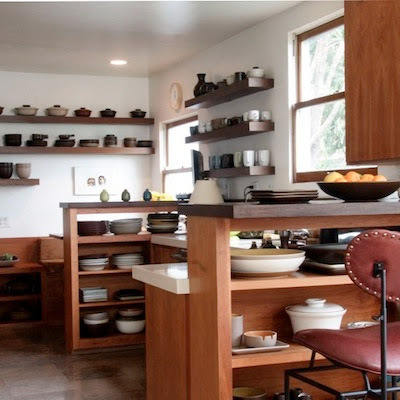 I love to see pictures of open shelves, but I know myself well enough to know that I would be bothered by the thought of "crud" getting on my dishes. Once upon a time, cupboards to keep things nice were the luxury- if you couldn't afford them, you had to put your thinks out on open shelves. My, how things have changed! 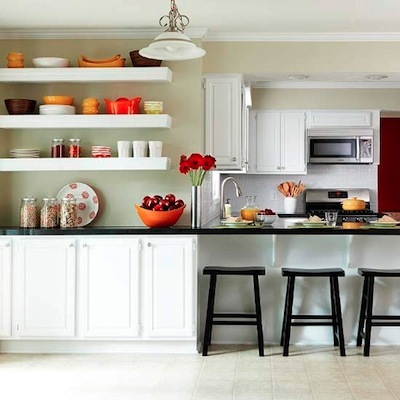 The same can be said about painted cabinets and beautiful wood cabinets. 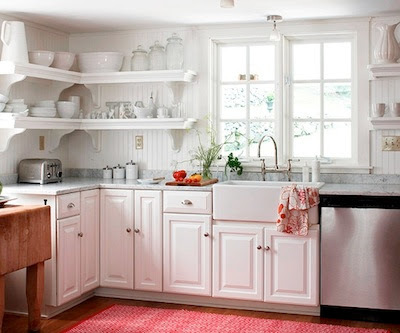 You had painted cabinets because that was less expensive and the solid wood was the luxury. I am amazed to see everyone painting the wooden cabinets. The white is bright but there is no going back! I've never gone so extreme with open shelving, but in my last two houses I've made it a point to take doors off of cabinets as soon as I moved in. The things I have in there are all my daily used things like glasses, plates, bowls, mugs, and matching wine glasses. I make sure all glasses are upside down so nothing accumulates inside and all of the others are used so often that no wipe down is needed. Placement is also extremely important! I've always read about the gunk that can get on everything so my shelves are on the opposite end of the kitchen away from the stove and I've never had any build up. This is going to sound crazy but it is my top secret thought (which is why I am anonymous)- I think someone hates housewives! And let's be honest, women still do most of the housework. Open shelves to clean and dust, houses with hardwood floors, tile, AND carpet so you have three kinds of cleaning products to deal with. Glassed in showers - try keeping the glass spot-free - whatever happened to the shower curtain? Giant tubs that no one uses because it takes forever for the tub to fill (I don't have one but I have friends who put in these tubs because the builder said they are a selling point - the tubs have never been turned on. One of my friends stores in laundry baskets in her big tub!) Chargers under a dinner plate - why? Don't we have enough dishes to wash already!!! And the bedrooms - I am lucky I get the bed made every day; once it is made, I'm sure not going to lay a 3 foot square piece of yellow fabric across the bed for a "pop of color" - if I want my bed to have a pop of color, I'll buy a yellow quilt or blanket. And the tons of pillows piled on the bed!! Who wants to throw those on the floor at bedtime and put them back on the bed each morning! And the latest designer trend seems to be putting your books on the shelves with the pages facing OUT for a uniform look!! Give me a break - I have 65 feet of bookshelves in my house and every book is important to me - I'm not about to look at the pages rather than the covers!!! Homes should be clean, comfortable, and kept simple enough that families have time to spend with each other. I might have one pillow on my bed, one open shelf and one decorative object but you will never see my house with tons of open shelves, etc. By the way, I found your blog earlier this summer and went back to the beginning and am reading every post in chronological order! Very enjoyable with excellent organizational tips. I wonder if you would consider posting the floor plan of your house on your blog? Thanks for reading this - sorry for the rant - just some of my pet peeves!!! What a wonderful rant, and here I am 7 months later discovering it. Don't know how I missed it. In any case I don't think you need to be Anonymous. Very true thoughts. Hope you enjoyed my blog. It has gone through transitions over time. And as to my floor plan.... Have you seen my Laundry room redo- happened after this post. It is here and I have my first floor plan posted there. http://www.ashbeedesign.com/2012/12/laundry-room-reveal.html. Don't have the second floor digitalized but it has a partial second floor with 2 small kid's bedrooms, a play room and a 2nd bath. After something over 50 years of cooking, I do not have things that are all decorator-matchy-matchy. I have things that work. I love to cook. I can, I dehydrate, I cook from scratch, and I want things at my fingertips, but I also want them behind cabinet doors so that when I turn out the lights at night, my kitchen looks as clean an uncluttered as possible. The exception to that is hanging rails I bought this year at Ikea to hang my utensils on. 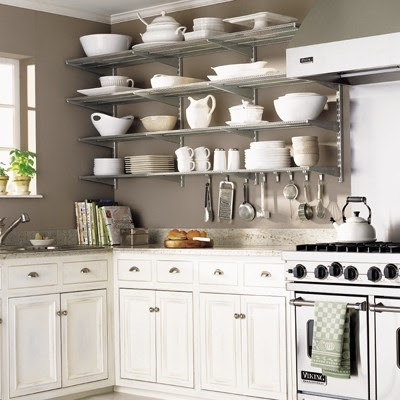 They were hard to find in the big crock and second utensil holder, so I hung them up and I love them there, all lined up against the wall, on both sides of my stove, ready for service. Drawers are not an option. I only have three, and they are as full as I want them to be. I like what you observed, and I like what Anonymous observed! At 70, I want clean, accessible, but covered storage. I must take great pains not to fall, and therefore must not climb to reach things, because I am at extreme risk of bone fractures, so my kitchen is arranged for me, and not for someone's idea of "cute", or "pretty". It's functional, and that's what a good kitchen should be, IMHO! I must mention light. A well-functioning kitchen must, must, must have super excellent lighting! Super lighting is essential! I have bright lights overhead and task lighting under all the upper cabinets. I turn them ALL on when working in there. My kids tease me when they come home. They think it is lit for surgery! yes also on the importance of a kitchen being functional. When we built our home I designed a kitchen- basic triangle. Fifteen years later, I redesigned the kitchen, with spaces designed for how we use it. A much better kitchen now. Thanks for visiting and taking the time to comment. I had stopped my Don'ts series because I wasn't getting any response or viewership. Might start it again.